Linnet in Oriel: All sew together. I am very excited and a tad tingly. Finally after all the procrastination, at the weekend I made something with my sewing machine. I actually made two pillowcases, they are a little bit crooked, a little bit wonky and needless to say that if Patrick from the Great British Sewing Bee looked inside he would not be impressed by my seams. I had a few anxious moments along the way, I can tell you. 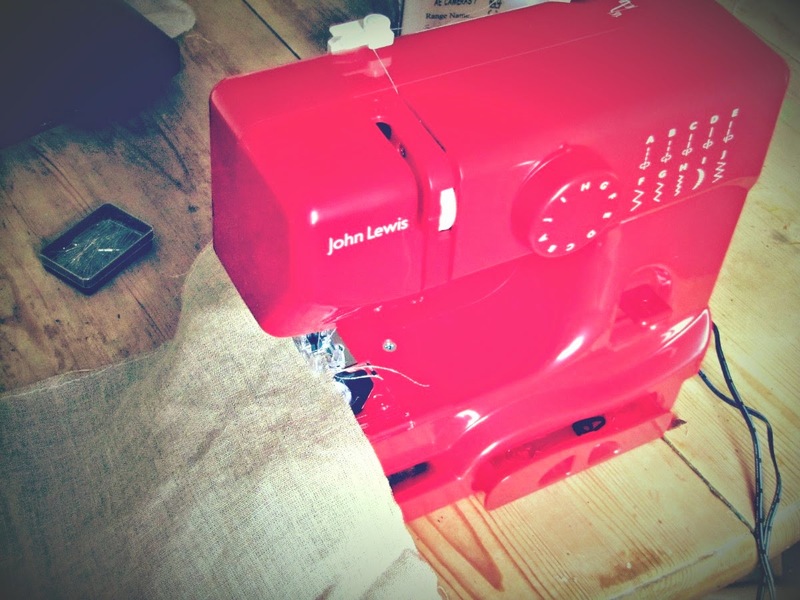 First I got a great wedge of fabric stuck in the thingy-ma-jig ( I mean the feed dogs) I thought I was going to have to tearfully phone John Lewis and explain that I had broken my wee sewing machine on its first proper outing! After managing to remove the trapped fabric with much pulling, poking, cursing and praying to St Anthony, I then had the shocking realisation that I had not sewn a completely straight seam so there was some gapage in the seams and then I sewed one bit on back to front, it was completely exhausting but sooo much fun. E had a little turn pressing down the pedal to make the machine go while I held the fabric but she kept ignoring me when I yelled STOP so she flounced off and played with her dads iPad. Mr S and O were out for a walk with the dog so I was delighted to show them all my afternoons work when they all came back from the muddy fields and the virtual woods. Mr S attempted to settle down and watch the football but did look at little alarmed when I burst in to show him yet another mistake. I made the covers from some spare pieces of curtain material that we had left over from trimming our Ikea curtains. Mr S claims that he 'hates' these curtains but so far he has been a complete sport and not complained about the matching cushions now cluttering adorning the bed! Thank the Goddess of common sense that I did not blithely start learning to sew with my gorgeous collection of vintage scarves. The pattern for the simple covers is available from this cute blog here. I must say while I was sewing I was transported back to first year in secondary school to domestic science, Mrs W and those loathed Bernina machines that I found nigh on impossible to thread. Why, oh why did I not listen to Mrs W at the time? Is it interesting that the two skills that I had the opportunity to learn at school-sewing and violin-the two lessons that I couldn't stand are now the very skills I really really want to be proficient at. Anyway, that is enough navel gazing for now. Congrats! I am also a novice sewer after hating it in home ec lessons years ago...and I love Lynda, and not just for her sewing skills, what a fabulous woman! Hello to The Morleys! Welcome. Hmm, maybe sewing is not meant to be a subject one is compelled to learn. Lynda is fab isn't she. I'm so glad you are watching TGBSB all the way out there in Borneo. Thanks so much for leaving a comment. Shauna...hello what a lovely description you have given me. I love your red machine...adorable and the cushions look fab. Large v sharp dressmaking scissors, simple as that and they must never be used to cut anything other than fabric...! yipee Sewing Bee tonight and the start of our sew-along tomorrow tra la la happy sewing...Lynda to win!! Yes Daisy, thank-you simple advice but necessary advice. My scissors were last used to cut some unruly elder shoots so I think a spanking new pair are needed. Great first post on the sew along-gosh it must have taken ages-lovely detail for us novices. We weren't happy that Lynda didn't make it, strange as she'd won the best outfit first and the blonde woman (can't remember her name as I can't get too excited about her) made a dreadful white dress that didn't fit. Pah. I'll miss the final as being a hair model tomorrow so I'll have to close my eyes and ears until Wednesday night won't I. Good luck with your sewing adventures, I think that Miss Daisy really knows her stuff so you're in good hands there. Thanks for your support, it meant a lot. Ironically despite governement and local council not fully appreciating what we really need in society I am also hampered by a ridiculous woman in her 60's as my boos who cares for paperwork not people. At present we are watching her go through the early stages of a breakdown (had one before) and she clutches at blaming us for all her mistakes. Hideous to watch as nothing we can do. What a shock ending to the sewing Bee? !